Looking for an interesting job or sport to discuss in class? 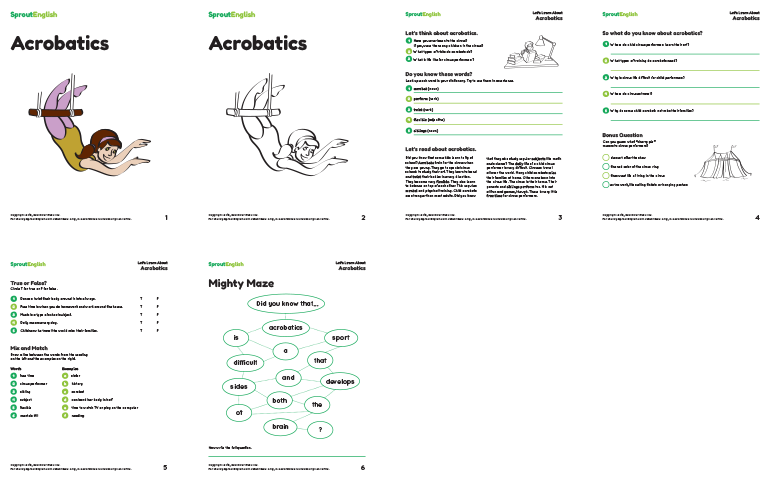 Kids will love finding out what life is like for a circus performer in our featured lesson on Acrobatics. This Discovery Center lesson includes discussion questions, pre-reading vocabulary, a short reading full of interesting facts, comprehension questions, vocabulary review exercises, and a word maze. There is even an optional black-and-white title page for your young learners to color. You may also want to try these fun activities from Tara Benwell: Clowning Around in the ESL Classroom. Find this lesson in the Discovery Center – Sports section. Sprout English’s Discovery Center has many other interesting facts for kids to discover! Explore 36 lessons about animals, food, transportation, famous places, interesting jobs, and sports.